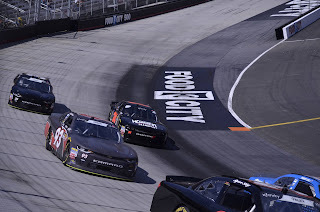 Jeremy Clements picked up the 1st last-place finish of his NASCAR XFINITY Series career in Saturday’s Fitzgerald Glider Kits 300 at the Bristol Motor Speedway when his #51 All South Electric / RepairableVehcles.com Chevrolet was involved in a multi-car accident after 4 of 300 laps. The finish came in Clements’ 273rd career start, dating as far back as 2003 and covering all but two XFINITY Series races run since November 20, 2010. In the XFINITY Series last-place rankings, it’s the 7th for car #51, the 314th by reason of a crash, and the 499th for Chevrolet. Across NASCAR’s top three series, it’s the 32nd for the #51, the 1,133rd by reason of a crash, and the 1,586th for Chevrolet. Eight months ago, Clements pulled off one of NASCAR’s most popular upsets in recent years. That day at Road America, Clements not only scored his first XFINITY Series win over the heavily-favored Joe Gibbs Toyota of Matt Tifft, but did so despite spinning with Tifft as the two raced toward the white flag. It was the hard-fought reward for Clements and his family’s Spartanburg, South Carolina-based team. The driver made his XFINITY debut on July 26, 2003 at Pikes Peak International Raceway, where he ran 31st in a race won by Scott Wimmer. His father Tony began fielding cars in the series in 2008, and the driver attracted sponsorship from RepairableVehicles.com during his tenure with JD Motorsports two years later. From the 2010 finale at Homestead to today, Clements has made all but two of the XFINITY Series races run during that span. The Jeremy Clements Racing #51 has been a fixture in the garage area since the 2011 opener at Daytona, where Clements finished 16th, propelling him to the first of seven consecutive seasons finishing Top 20 in the points. Prior to Road America, his best finish in the series had been a 4th at Talladega, where he led his only seven laps of the season. Through it all, Clements had not once finished last in an XFINITY Series race. In fact, just one time did he come within one position of doing so: November 3, 2007 at Texas, where the #36 McGill Motorsports Chevrolet he was driving was involved in a multi-car wreck with Mike Bliss and Brad Baker. On Saturday, another wreck would have a different result. Clements began the weekend with a new sponsor on the hood of his black-and-red Chevrolet. All South Electric joined the Bristol effort, buying space on the hood. The brand caught some attention in Friday’s opening practice, where the #51 turned the 14th-fastest lap, then held 16th in Happy Hour. In qualifying, Clements dropped a couple more spots to 19th with a speed of 123.865mph (15.491 seconds). It was his second-best starting spot behind a 12th last Saturday in Texas. Clements led his first lap of the season that day and came into Bristol 15th in the standings. The head photo for this article, taken by Marcus Leno at TheRacingExperts.com, shows some damage to the right-rear of Clements’ Chevrolet in the lead-up to the race. Other small teams had even bigger problems with the outside wall. B.J. McLeod, set to celebrate his 75th XFINITY Series start, clobbered the wall on Friday, destroying his #78 EPIC Racewear Chevrolet. The team literally burned the midnight oil, sending the car back to the shop in Mooresville, preparing the backup, and towing it back to Bristol in time for qualifying on Saturday morning. The RSS Racing team lines up for the start on the outside lane. Sieg's #38 in the foreground, Yeley's #39 in back. As McLeod put his car 26th on the grid, Ryan Sieg lost control off the fourth corner and destroyed his #39 Lombard Brothers Gaming Chevrolet. With the team’s backup set up for 1.5-mile tracks instead of short courses, the decision was made that Sieg would instead drive his teammate J.J. Yeley’s #38. There was only time to change the names on the roof rails of both cars, meaning that Sieg would take the green flag in the #38 with Yeley’s name on the windshield banner. Like McLeod, both drivers would incur tail-end penalties for the swap. The lone driver who failed to qualify was Morgan Shepherd, the first time he’d failed to make the spring race at Bristol since 2016. Also sent home was ARCA Racing Series competitor Tony Mrakovich, who was originally slated to take the place of Dylan Lupton in JGL Racing’s #28 Smart Emissions Reducer Ford. Mrakovich struggled in opening practice, his best of two laps more than four seconds off the pace after he smashed the wall with the right-rear, and was second-slowest in Happy Hour. Las Vegas last-placer Dylan Lupton returned to qualify and race the car, lining up 33rd. Starting 40th on Saturday’s grid was David Starr in Jimmy Means’ #52 Chevrolet. The team welcomed sponsorship from Franklin Signs & Graphics, the company that helped design the Means team’s paint schemes and sold them decals. He lined up next to Cody Ware, who stood in for Mike Harmon on Friday. Harmon’s #74 team fielded a Dodge for the first time since their DNQ at Daytona, and carried new sponsorship of their own from Horizon Transport. On race day, the pair were joined at the rear by Yeley and Sieg in each other’s cars, McLeod’s backup #78, and Michael Annett, sent to the back for unapproved adjustments on his #5 Pilot Travel Centers Chevrolet. By the 5th lap of the race, Cody Ware had taken last when trouble broke out near the front. Third-place starter Christopher Bell slowed on the outside lane off Turn 4, and those running behind checked-up. The logjam started behind 14th-place starter Ty Majeski, whose #60 SunnyD Ford was rear-ended by Kaz Grala’s #24 NETTTS Ford. Clements, running right behind Grala, had nowhere to go. The three cars piled into each other and skated up the track, ultimately collecting another three. When the dust settled, Clements’ #51 was facing backwards with the front valence caved-in, fluids leaking down the banking. Out of all the cars involved, Clements’ was the only one unable to continue, leaving him last. Kaz Grala’s damaged #24 made it another 22 circuits before he joined Clements in the garage, leaving him 38th. While both Jeff Green and J.J. Yeley exited early to finish 39th and 37th, Sieg wheeled Yeley’s “start-and-park” car to a strong 15th-place finish, Sieg’s best finish of the year. Rounding out the Bottom Five was Chad Finchum, who had engine trouble on Carl Long’s #40 Concrete North, Inc. Toyota. 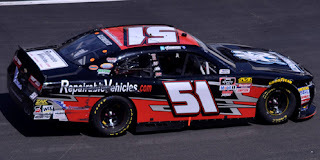 *This marked the first last-place finish for car #51 in an XFINITY Series race since June 19, 2004, when Stan Boyd’s #51 Ware Racing Enterprises Chevrolet (fielded by current Cup Series car owner Rick Ware) had ignition issues after 2 laps of the Meijer 300 presented by Oreo at the Kentucky Speedway. The number had never finished last in an XFINITY Series race at Bristol.